The device is recommended for individual use and shall be applied for the prevention of flu, common cold, treatment of ENT-diseases and nasal hygiene(for people working in hazardous environment and sportsmen); the device is used for nasal and nasopharyngeal irrigation and lavage by the special solution. The device is convenient for safe nasal lavage, and influences the entire length of paranasal sinuses, thus making the lavage procedure different from sprays and drops, which irrigate only a part of mucous membrane. The device can be applied to regulate the power and speed of solution supply into the nasal cavity. The procedure is simple and safe even for children and pregnant women. Mineral contents of human blood are almost identical to the mineral contents of the Ancient Ocean. About 250 million years ago, in Permian Age, the Ancient Ocean was a significant part of contemporary Eurasia. Nowadays scientists are familiar with only one place, from where they can extract minerals of the Ancient Ocean, which still have their initial contents and qualities. The site is located in the Russian Federation, more than 700 meters below the sea level. During the continental changes, with the dry land growing larger, there has been occurring the process of ocean waters crystallizing and precipitation of minerals. Thus, for hundreds millions of years, the Erath has given birth to the site, which now has a huge number of micromineral and biogenic matters, crystals with the conserved water (it does not evaporate) and microsamples of natural gases. We have learnt how to preserve the healing power of minerals of the Ancient Ocean. For this purpose we have developed a technological process convenient for step-by-step underground selection and extraction of ecologically pure crystals, followed by their mixing in specific proportion by the particular recipe and their further conservation using dry enrichment. Only this highly laborious process can guarantee total safety of the biogenic ingredients of microelements with ionic structure. The mixture of minerals from the Ancient Ocean uniquely includes halite, carnallite, natrium, magnesium, potassium, iodides, bromides and sulphate-ions. When dissolving minerals of the Ancient Ocean in pure water, we have founded a solution, which contents are close to the trace elements and plasma in human blood; we have called the solution 'DOLPHIN'. The solution can be used in different inflammatory and allergic processes occurring in mucous membranes and paranasal sinuses. Microelements of the solution have a direct effect on the mucous membranes. Iodine and sodium chloride have the antiseptic effect. Magnesium ions normalize the ciliate epithelium function, improving the physiological condition of the nasal mucous membrane, especially after surgeries. Zinc and selenium ions participate in the secretion of lysozyme, interferon and antibody, thus restoring local immunity of the nasal cavity and paranasal sinusitis. Iodine and microelements activate the supply of protective mucus generated by the chalice cells. We have supplemented and balanced the contents of "Dolphin" solution with bioactive substances of licorice and rose hips, which we gather in the Highlands known for their ecological purity. Rose hips have the bactericidal effect along with the unique multi-vitamin qualities. Licorice has the anti-allergic influence, regulates the water-salt metabolism and contains flavonoids, which secure health from the hazardous environment. 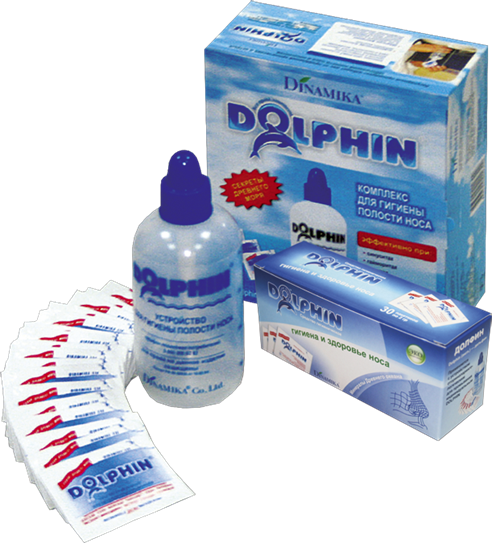 From the unique contents of mineral-vegetable means "Dolphin" and from the positive effect of its every component, it becomes evident that "Dolphin" kit has a diverse healing effect on the nasal mucous membrane and paranasal sinuses. 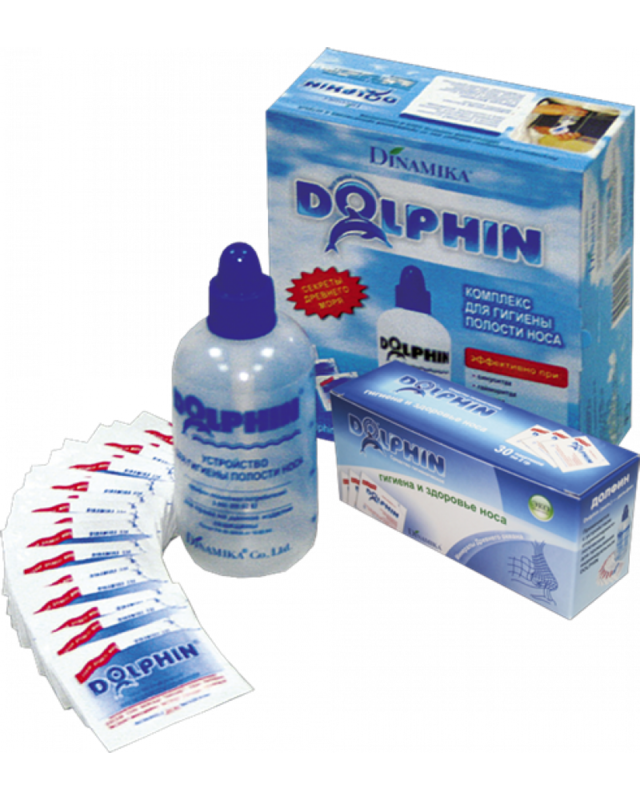 When performing nasal lavage with "Dolphin" kit, the nasal mucous membrane purifies from the pathological secretion along with the microbes, allergens and dust; afterwards mineral-vegetable "Dolphin" means positively influences the purified membrane, decreasing edema and inflammation and improving the capillary tonus. Purification significantly improves functioning of the ciliate epithelium of the mucous membrane, intensifying the mucus flow and increasing the protective qualities of the nasal mucous cavity, hence leading to the profound preventive effect. Mineral-vegetable means "Dolphin" is used for composing the solution applied for nasal and nasopharyngeal lavage and for mouthwash. It is supplied as a powder in packets 2 g each.